Alfons Maria Mucha 24 July 1860 – 14 July 1939. Mucha produced a flurry of paintings, posters, advertisements, and book illustrations as well as designs for jewelry, carpets, wallpaper and theater sets in what was termed initially “The Mucha Style” that later became known as Art Nouveau. CEDAR RAPIDS, IA.- Paintings, jewelry, sculptures and lithographs comprise the opening exhibition Alphonse Mucha: Inspirations of Art Nouveau on view now at the National Czech & Slovak Museum & Library. More than 230 pieces from the Mucha Foundation in Prague and in London are included in the exhibit. Art Nouveau influenced much of the decorative arts during the mid 1880s to 1910. Not only glassware, jewelry, painting, textiles, and pottery but also graphic work and architecture were transformed by the wave of this modern style. Artists at the time drew their inspiration from both organic and geometric forms to develop a flowing, elegant, and natural approach with or without florals. In some respects Art Nouveau was a reaction against the cluttered designs of the Victorian-era. Its style created a more united approach with curvilinear elements. Art Nouveau is French for new art and was made popular in Europe by Moravian born Alphonse Mucha. The Cedar Rapids exhibition is the largest ever to appear in the United States and is making just one stop. “We had been working with the Mucha Foundation for more than a year to bring this exquisite exhibit to the U.S. and we are particularly thrilled that it will be the inaugural exhibition for the opening of a world class national museum. The lush beauty of art nouveau, its architecture and influence is recognized by people all over the world,” said President/CEO Gail Naughton. Alphonse Mucha: Inspirations of Art Nouveau is divided into six sections and explores Mucha not just as the father of Art Nouveau, but also Mucha’s Moravian roots, his family, his photography and his devotion to the Slav people. The artist, Alphonse Maria Mucha (1860-1939), was born in Ivančice, Moravia. He worked as a painter and studied art in Austria and Germany, before moving in 1887 to Paris. He is most often remembered for the prominent role he played in the shaping of art nouveau at the turn of the century. Mucha returned to Moravia in 1910, where he dedicated the remainder of his life to the production of the Slav Epic, a series of 20 paintings depicting the history of the Slav people. Parisians paid poster hangers for copies, or simply stole the posters right off the streets. 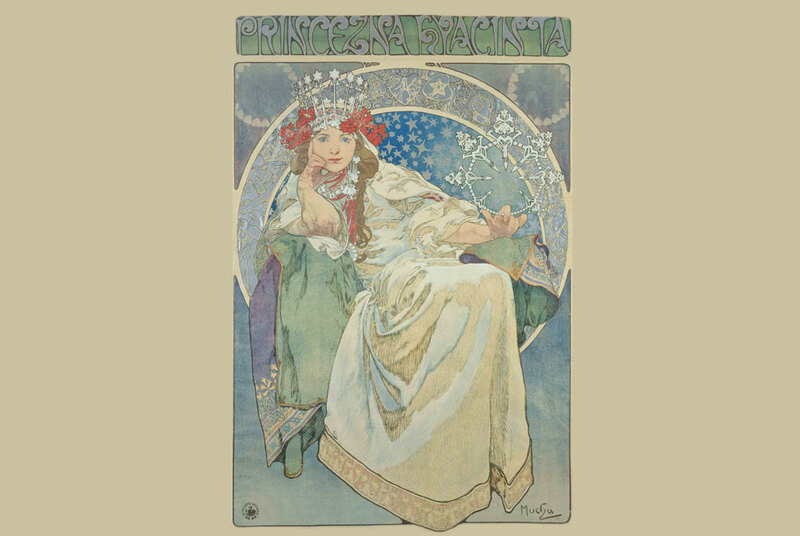 Sarah Bernhardt was so pleased with Mucha’s work that she offered him a five year contract to produce posters as well as stage and costume designs. • La Dame aux Camellias, 1896, color lithograph Sarah Bernhardt starred in the play by Alexandre Dumas.